Although I do this on a fairly regular basis, I absolutely despise moving. The only fun part of it is packing books, because then it becomes a lot like a slow-moving Tetris game, since all books are roughly the same size and shape. I suspect there’s just something tucked away in our tiny lizard brains that wants us to use space as efficiently as possible, and Square Busta beautifully taps into that primitive impulse. 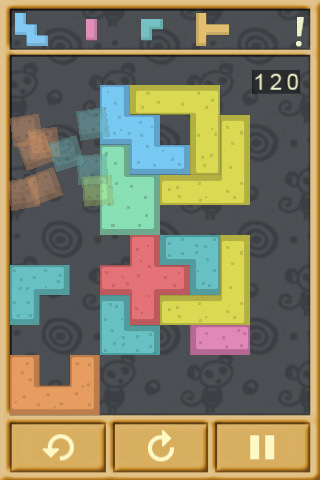 In Square Busta, you take various shaped blocks and try to fit them together to form rectangles and squares. Blocks appear along the top of the screen and you drag them down and try to fit them together like the geometric master you are. Rather like Tetris, you can rotate the pieces to fit them into place, but unlike Tetris, pieces don’t have to sit along the bottom. You can basically cram them in wherever you have room, but pieces won’t disappear until they make a rectangle or square, and keeping enough playing room open is key, as the game ends when too many pieces are piled up along the top, so you want to be constructing squares as quickly and efficiently as possible. As a game, Square Busta is really pretty simple, but it’s satisfying on a basic level. My own big complaint with the game is that it takes a long time before it starts to feel challenging, which hurts the pick-up-and-playability of the game somewhat. Instead of frantically trying to build squares in a five-minute frenzy, it’ll take you a fair amount of time to work up to a difficult spot, and once you get there, it’s over all too soon. In particular, the introduction of new pieces is a little more abrupt than I would like. Part of the joy of Tetris is in knowing how to manipulate the same pieces over and over again, even if the order they spit out at you isn’t ideal, but Square Busta tries to trip you up by suddenly throwing a completely new piece at you without any warning, but it’s generally not too hard to cope with. Presentation and interface-wise, Square Busta does a good job of making use of limited real estate. The shapes are nicely distinct and big enough to make moving them around simple, and while the music gets a bit repetitive after awhile, it’s easy enough to mute. I would have liked to have seen the option to play your own music and some local leaderboards in addition to the OpenFeint leaderboards, but I was pleased by the large number of OpenFeint achievements available for the game. While it’s certainly not life-changing, Square Busta is a cute and fun little game for the Tetris-loving puzzle crowd. AppSafari review of Square Busta was written by Tracy Yonemoto on October 5th, 2010 and categorized under Action, App Store, Board, Games, iPad apps, Puzzler. Page viewed 3059 times, 1 so far today. Need help on using these apps? Please read the Help Page.